Specialism: Commercial, Wills and Probate. Services: Commercial, Dispute Resolution, Practice Management, Wills and Probate. 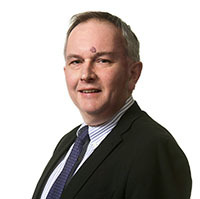 Paul is a Solicitor and LLP member of Clarkes. He is a graduate of Cardiff University and has over 30 years experience in providing cost-effective and speedy legal services to clients from Shropshire and afar. He has developed a substantial following in the business world dealing with both local and national owner managed businesses and their proprietors, who return to him time after time for both their business and personal work. Paul undertakes all aspects of commercial, agricultural and other property work, sales, purchases, leases and property development and also enjoys the challenges of company and commercial work, with expertise in dealing with corporate finance, company sales and purchase, franchises and trading terms. In addition (and rare for a commercial property lawyer), Paul is a member of the Society of Trust and Estate Practitioners (STEP) and is able to give his clients practical wills and tax planning advice.